An automated weather station (EE-WMS-AQM) is built at the component level to provide an organization with the instruments it needs to meet its measurement objectives. The versatility of this automated weather station is evidenced in your ability to add, remove, or substitute sensors or other peripherals as your data measurement and monitoring needs change. To assess the numerous grade automated weather station models and ultimately determine which components are the most suitable, you should first identify your application’s needs and requirements. Your familiarity with these items will help ensure that the automated weather station components you select will meet your compliance requirements. Air pollution comes from many different sources: stationary sources such as factories, power plants, and smelters and smaller sources such as dry cleaners and degreasing operations; mobile sources such as cars, buses, planes, trucks, and trains; and naturally occurring sources such as windblown dust, and volcanic eruptions, all contribute to air pollution. Air Quality can be affected in many ways by the pollution emitted from these sources. These pollution sources can also emit a wide variety of pollutants. The E&E Solutions made Portable Particulate Monitors, PPM-01, uses laser light scattering principle based sensors to give accurate and reliable values of particulate matter. PPM-01 is a hand-held air quality monitor which can monitor particulate matter in indoor/ambient air. Particulate matter measurement is taken in three ranges, PM1, PM2.5 and PM10. The PDM-01 has a very easy user interface and comes with inbuilt data logger. Rechargeable batteries provide continuous operation till long hours. In order to measure PM10 and PM2.5 levels in ambient air, two different samplers need to be operated simultaneously. The combo sampler reduces this effort and combines both the sampling into a single instrument, making it cost efficient and at the same time provides easiness in operation and transportation. Our Combined Sampler AI-103 is advanced state of art technology based instrument for combined sampling of PM10, PM 2.5 and four water soluble gases SO2, NO2, NH3 and O3. Many industrial and construction sites have the potential to expose their staff to harmful dust or vapours and gases. Inhalation is usually the most significant route of entry into the body and so monitoring the air they breathe is vitally important. This monitoring is often referred to as person air sampling and the instrument used for this purpose are called as personal samplers. Our Personal Sampler AI-110 samples the air inhaled by worker during his/her working hour. It is designed in such a way that it will hang through the worker belt/cloth and its suction point is kept near the nose of worker. 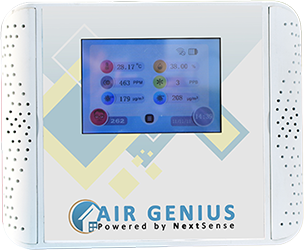 High volume Samplers are the basic instrument used to monitor ambient air quality. They have wide spread use all over the world to measure air pollution in industrial areas, urban areas, on the shop floor, near monuments and other sensitive areas. In our High Volume Sampler AI-105, air-borne particulates are measured by passing air at high flow rate of cubic meter per minute through a high efficiency filter which retains the particles. The instrument measures the volume of air sampled, while the amount of particulate collected is determined by measuring the change in weight of the filter paper as a consequence of the sampling. Indoor Air Quality (IAQ) refers to the air quality within and around buildings and structures, especially as it relates to the health and comfort of building occupants. Understanding and controlling common pollutants indoors can help reduce your risk of indoor health concerns. Health effects from indoor air pollutants may be experienced soon after exposure or, possibly, years later. Our Handy Sampler AI-107 is used for sampling suspended particulate matter in indoor air and two different water soluble gases like SO2, NO2. It uses a small light weight battery operated pump to draw air through 37 mm diameter filter and through suitable absorption solution contained in two impingers fitted in series. Particulate air pollution is separated into three classifications; coarse, fine and ultrafine particles. Coarse particles have a diameter of between 10µm and 2.5µm and settle relatively quickly whereas fine (0.1 to 2.5µm in diameter) and ultrafine (< 0.1µm in diameter) particles remain in suspension for longer. Our Fine Particulate Sampler AI-102 is precisely designed ambient air sampler for fine dust sampling. The AI-102 is a passive instrument for sampling fine particles (PM2.5 fraction) and is based on impactor designs standardized by USEPA for ambient air quality monitoring. Ambient air enters the series samplers system through an Omni-directional inlet designed to provide a clean aerodynamic cut-point for particles greater than 10 microns.